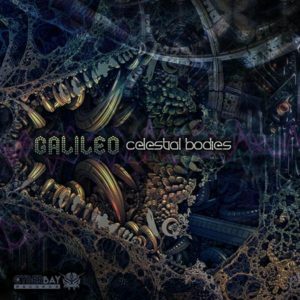 CyberBay Records is proud to present Celestial Bodies, the debut album by Israeli producer Galileo (Gali Hania). This album is a combination of sharp hi-tech sounds, dark psychedelic atmospheres, glitchy breaks, and strong musical content that will take you through space and time for a full body and mind trip. Mastered by Bruno Biomekanik @ BioLab, Berlin; graphic design by Alexander Volnik @ Alvo Creative Imaginarium. MP3 Download | FLAC Download | WAV Download · Download count: 12,068. I just go ‘WOW!’ after listening to this. Thank you very much for sharing! Incredible. bellissime tutte le traccie… SUPER !!! AMAZING!!! Fibonacci is an absolute blast!! Nice ! interesting atmospheres, it’s a good work. big big talent Galileo …Thanks for this release on Ektoplazm. download in wav, absolutely ! This album is fantastic. Really nice creative glitch/IDM breakdowns. Memorable songs. I love this ~160 BPM range too.